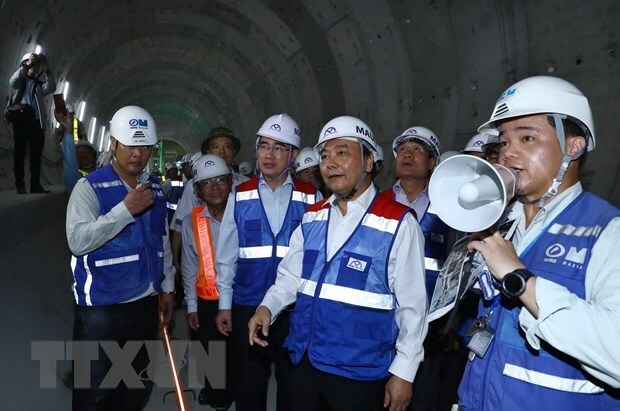 HCM City (VNA) – Prime Minister Nguyen Xuan Phuc and leaders of some ministries and agencies went to inspect the construction of Metro Line No. 1 in Ho Chi Minh City on April 12. Linking Ben Thanh Market in District 1 up with Suoi Tien Tourism Park in District 9, Metro Line No.1 is the first of eight metro lines planned in the southern metropolis, with a total length of about 220 km and accumulated funding of nearly 25 billion USD. The project, whose construction began in April 2012, includes four bidding packages using official development assistance (ODA) loans from the Japan International Cooperation Agency (JICA). By now, up to 63.49 percent of the workload has been fulfilled. The construction is expected to be completed in 2020 and the metro line, also the first of its kind in Vietnam, is set to be open to the public the following year. PM Phuc lauded the efforts made by ministries and agencies, authorities of HCM City, and officials and workers at the construction site during the implementation of the project. He described the project as a vivid manifestation of the strategic partnership between Vietnam and Japan, which marked the 45th anniversary of their bilateral diplomatic ties last year. He said the Vietnamese Government has worked with competent agencies to allow HCM City to take charge of adjusting total estimate of the project, thus ensuring resources for the construction.